"I've taken several implant courses from Dr. Schlesinger and have always been impressed with his knowledge and willingness to help. I’d previously taken Arun Garg’s Implant Continuum and after that felt like I had a “Bachelor’s Degree” in implants. Going to Chuck's courses made me feel like I was finally in grad school." "​​​​I have known Dr. Charles Schlesinger,superb dental clinician and gifted dental implants instructor, since I attended his first lecture about seven years ago in El Paso, Texas. After listening to him, taking notes and reading his handouts on the fundamentals of bone biology and dental implant placement, I was convinced that I would enrich my general dentistry practice by adding dental implants to my repertoire of dental procedures. That decision required some daring and challenges to my surgical skills, especially in mastering the bone grafting techniques. I am happy to have made that decision and have not looked back since, especially since I have had the telephone and e-mail availability of Chuck to answer my questions whenever I encountered speed bumps and/or roadblocks. He has always been there to guide me and for that I shall always be grateful. Now, I consider him a colleague and friend on whom I can rely for advice. I recommend Chuck's sage counseling and advice for any dental doctor contemplating implants as an added procedure to his/her practice. With Dr. Schlesinger's expertise to back you up, there is no way you can go wrong. So go for it. I recommend him very highly." "​If you are like me and looking to grow your practice and become the sought after implant dentist in your community or if you just want to provide exceptional implant dentistry to your existing patients you will want to know Dr. Schlesinger. Over the past few years I've followed Dr. Schlesinger around the country attending his courses and developing a professions and personal relationship with him. During this time my skills and confidence have increased to the point where I now find myself able to help and mentor other doctors through complicated implant procedures. Thank you Dr Schlesinger for being a mentor and sharing your knowledge." "Dr. Schlesinger's implant course was some of my first exposure on placing dental implants. His knowlege gave me the confidence to start placing implants on simple cases Monday morning. Thank you Dr. Schlesinger for the knowlege, confidence and support." "... from first implant placement seminar to a personal one-on-one session at my office, Dr. Schlesinger has been instrumental in initiating my success and confidence as implants have become a large part of my general practice. He has always been there when needed and his expert advice continues to offer support in learning more about the implant specialty." "Not only was Chuck a major contributor to my dental school years as my mentor for all things from didactic to practical to clinical work... 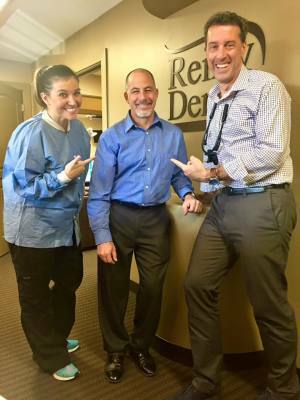 So it was only very fitting that 20 years later he be the one to come for three days in-house at Reilly Dental and mentor me over-the-shoulder as I learned to place dental implants (a long time professional dream of mine). There is no one on Earth I'd rather take instruction from as Chuck's positive, clear instruction style hasn't changed a bit in all these years, and that certainly helped me get over learning such an intimidating procedure (and successfully place 14 implants on four patients over two days). Even my assistant, Juliana, learned a ton with all of our new surgical techniques and grew her skills tremendously. Thanks, Chuck, for the knowledge you bestowed upon our team, the confidence you shot me with, and for the new benefits you've given the patients of Reilly Dental.